Yes, we the British Public are the biological phenomena and our governemnt are the ones who want to statisticaly study us. By signing over your biometrics to the government you are effectively signing away your rights to privacy and freedom forever. Most of the population are unaware that in 2008 our government will demand you attend an ID Interrogation centre (they are currently being built in these cities) for the purpose of requiring an Identity Card and storing your details on the National Identity Register (NIR). Here you will undergo an intrusive interview where you will have to reveal personal details about yourself and your life history. Then your biometrics will be recorded. The irises of your eyes will be scanned and stored. Each of your digits will be scanned and added to their mass database. If you thought fingerprinting was only for criminals, think again. These details will be made available to any government linked company and will also be sold to commercial companies such as banks and insurance companies. Soon, to gain access to any public place (such as shops, banks, your workplace) you will have to provide your biometrics, and in doing so leave behind a unique lifetime trail for anyone to pick up on. Places you may not expect have already began using fingerprint biometric entry schemes, such as pubs and theme parks. The systems are even being seen in our schools. Fingerprints are easy to fake (see video here of how long it takes these guys to hack a fingerprint scanner.) Databases will always be hacked and computer errors will be made. 71% of people already believe it is inevitable that the data stored on people's identity cards will at some point be leaked, sold, hacked into or in other ways used improperly (from younggov stats). Do not be under the assumption that signing up for the National Identity Register is voluntary. The government have made sure this is compulsary with hefty fines if you refuse, or fail to keep the information up to date. You will also have to pay around £50 for the initial ID card and the governemnt are putting aside a whopping £5.4 billion to set the scheme in motion. Many councils have opposed the introduction of this system, view a full list of them here. The Scottish Parliament, and the Welsh and London Assemblies have all passed strongly worded motions against ID cards. Many of these will refuse to cooperate with the ID scheme and so should you. We are already the most watched counrty in the world, this mass monitoring is the final nail in the coffin. Once you allow this to happen, there will be no choice, no turning back. Total surviellnce, total monitoring and total control. Do something today. Sign NO2ID's petition. Write to your local MP telling them you oppose the idea. Educate yourself on the full implications. 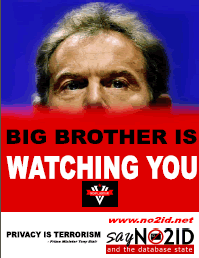 Spread the word and stop your country turing into George Orwell's vision of 1984. Watch the governement's own ID card promotion film and see for yourself. Feel free to leave comments to show your support, or to voice your opinion. I did no t know about this. i thought the id cards where still being decided. no, they were going to be voluntary but now they are complusary. I'm not keen on the idea of being 'scanned in' everywhere what if the computer mucks up, so you cant get money out the bank that day or go for a pint? And what if it says you're someone your not you could end up thrown in jail? I don't think so!! Great idea Blair and his possehave dreamed up this time, it will never work! People will surely protest this. It isn't right because it will be abused like all things are. They think they can just make up laws whenever they please. What about what WE want or does it not even matter any more?>? ?